Cocoa beans are stored in silos or warehouses in their original sacks. Imported raw cocoa is subject to a strict quality control. Laboratory technicians ensure that the beans are healthy, perfectly fermented and dried, and have suffered no damage during transport. Silos, measuring from 40 to 120 feet in height can store up to 1000 tons or more. The raw cocoa is sucked up by powerful vacuums and fed into the silos. The storage area must be isolated from the rest of the building to protect the sensitive beans from strong odors that might be absorbed. Good air circulation and a cool temperature are important, and the humidity regularly checked. You must be able to identify the beans according to their particular type and origin in order to control the flavor by blending beans for roasting. The process of making chocolate starts with the cocoa beans being passed through a machine that removes dried cocoa pulp, pieces of pod and other extraneous material. The beans are carefully weighed and blended according to specifications. Finally, the last vestiges of wood, jute fibres, sand and even the finest dust are extracted by powerful vacuum equipment. The separated cocoa bean husks are passed on to the chemical industry which extracts valuable compounds. To bring out the characteristic chocolate aroma, the beans are roasted in large rotary cylinders. Depending upon the variety of the beans and the desired end result, the roasting lasts from 30 minutes to two hours at temperatures of 250 degrees Fahrenheit and higher. As the beans turn over and over, their moisture content drops, their color changes to a rich brown, and the characteristic aroma of chocolate becomes evident. Although all steps are important, proper roasting is one of the keys to good flavor. The cocoa beans are cooled quickly and their thin shells, which have become brittle by roasting, are removed. A giant winnowing machine that passes the beans between serrated cones so they are cracked rather than crushed. In the process, a series of mechanical sieves separate the broken pieces into large and small grains while fans blow away the thin, light shell from the meat or "nibs." Here's where the first secrets of the chocolate manufacturer come in. The nibs are blended, combining as many as 8-10 varieties. It is control of these subtle mixtures that maintain a constant quality and brings out the flavor of each particular variety of chocolate. The nibs, which contain about 53 % cocoa butter, pass through refining mills and are ground between large grinding stones or heavy steel discs creating a cocoa paste. The paste is subjected to hydraulic pressure, and the cocoa butter flowing out is a pure and valuable fat with a marked aroma; after filtering and purifying it looks very much like ordinary butter. The cocoa butter has important functions. It not only forms part of every recipe, but it also later gives the chocolate its fine structure, beautiful lustre and delicate, attractive glaze. The heat generated by grinding causes the cocoa butter or fat to melt and form a fine paste or liquid known as chocolate "liquor". When the liquid is poured into molds and allowed to solidify, the resulting cakes are unsweetened or bitter chocolate. Up to this point, the manufacturing of cocoa and chocolate is identical. The by-product of cocoa, cocoa butter, is the essential component of chocolate… about 25% of the weight of most chocolate bars. To make cocoa powder chocolate liquor is pumped into hydraulic presses weighing up to 25 tons, and when the pressure is applied, 80% cocoa butter is removed. The fat drains away through metallic screens as a yellow liquid, and then is collected for use in chocolate manufacturing. Cocoa butter, unique among vegetable fats, is a solid at normal room temperature and melts at 89 to 93 degrees Fahrenheit… just below body temperature. With proper storage conditions, cocoa butter can be kept for years without spoiling. Most manufacturers add non-fat milk, flavors, sugar and other ingredients. The resulting product will contain between 10 and 22% cocoa butter. In the "Dutch" process, cocoa is treated with an alkali and develops a slightly milder flavor, and has a darker appearance. The alkali acts as a processing agent rather than as a flavor ingredient. Milk chocolate is made by adding milk, sugar, cocoa butter and other ingredients to the bitter chocolate liquor. At this point, Chocolate is prepared in according to individual recipes. 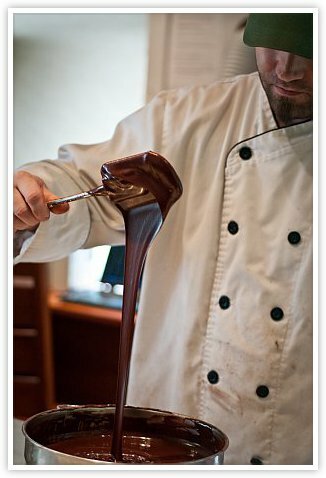 The blending of the various types of cocoa pastes and other ingredients determine the ultimate taste. The ingredients go into a mixer with rotating, kneading arms until the result is a homogeneous, paste-like mixture with a pleasant taste, but it still feels gritty to the palate. This process develops flavors and changes the texture during controlled temperatures. It’s the last and most important refining process, which allows the separate flavors of the individual ingredients to combine. Conches [the paddles of the early machines resembled conch shells] are equipped with heavy rollers that plow back and forth through the chocolate paste, anywhere from a few hours to several days. Contemporary technologies can grind the chocolate particles extremely fine, which can reduce conching times. Swiss and Belgian chocolates, are conched as much as 96 hours. Some chocolates are not conched at all, or for only 4 to 12 hours. Under regulated speeds and temperatures, these rollers can produce different degrees of agitation and aeration to create distinct chocolate flavors. The process can eliminate any remaining bitterness by aerating the chocolate and expelling volatile acids. Additional cocoa butter and lecithin are added which help to achieve the characteristic velvet smoothness. And as the ultimate homogeneity of the ingredients is developed, a soft film of cocoa butter begins to form around each of the extremely small particles. The chocolate no longer seems sandy, but dissolves meltingly on the tongue. It has attained the outstanding purity which gives it its reputation. The last stage of conching Swiss or Belgian chocolate is a magnificent sight… huge paddles rolling slowly through great vats of chocolate, smooth and creamy and thick. Circular conches use a rotary movement and can hold 9 tons of chocolate. They are the most efficient of the conch machines In some manufacturing setups, there is an emulsifying operation that either takes the place of conching [or supplements conching]. Emulsifying is breaking up sugar crystals and other particles in the chocolate mixture to give it a fine, velvety smoothness. The machine works like an eggbeater. This thickens the chocolate and imparts the right flow properties for filling the moulds. This complex operation is performed in the tempering plant and is necessary to give the final chocolate product a delicate composition, a uniform structure and a well-rounded flavour. The storage life is also increased in this way. 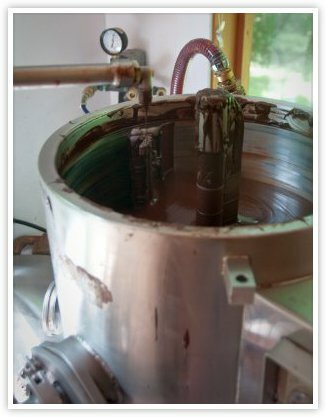 The still warm conched chocolate is placed in a tempering machine so that it can be slowly and steadily cooled. Cooling chocolate at a fixed rate keeps the flavor from being compromised, and prevents separation when the chocolate is poured into bar molds. Proper tempering also results in a silky sheen and crisp "snap" when broken… another sign of a superior quality chocolate bar. The tempered chocolate is pored into molds of many sizes, from individual sized bars to a ten pound blocks used by confectionery manufacturers. A necessary step, conches are always filled with the largest amounts of chocolate for efficiency, the molding machines can only accept small amounts of chocolate paste at one time, in order to shape it into bars, chocolates and other products. Chocolate is is frequently shipped in a liquid state to other food manufacturers, or it can be stored for short periods of time. For longer periods, it is solidified, usually in the form of hundredweight blocks. These blocks must be reheated before further processing so that they liquefy again.